Mary is an Eden Energy Medicine Certified Practitioner and a Reiki Master Practitioner. She holds a Masters Degree in Theology and Pastoral Ministry, a BA in Religious Studies, and is formally trained as a registered nurse. She also enjoyed the study of Matrix Energetics – Levels One and Two, and Advanced Integrated Energy Therapy. Her study of western conventional medicine, her rich experiences in pastoral ministry, and her journey into the study of the various forms of Energy Medicine leads to a passion for a holistic approach to health, spirituality and well-being. Mary believes the gift of opening to the healing properties of the energy surrounding us strengthens our body, mind and spirit for healthy and balanced living. She is committed to guiding her clients on a personal journey of connecting to the deep wisdom of our energies and the world around us. Initiate a partnership with clients related to their personal journey. It is a private, respectful space in a lovely 100 year-old building. The office is located on the second floor accessible by a set of steps. 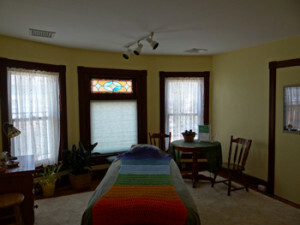 In this quiet atmosphere clients experience a gentle method of hands on healing. The goal of each one-on-one guided session is to help uncover and remedy the imbalances and disruptions in your body’s energy, caused by life’s everyday stresses. Click here for more information about Your First Session and what to expect. *Please Note: Home visits available only within the Lehigh Valley for those challenged by serious health issues and those unable to leave their home. Call 732.674.2807 to inquire about at-home healing sessions.